Do you need a female gift, but are very short on cash? Are you making gifts from your kitchen and garden this year? Do you need a quick to make gift? This one meets this criteria, and is lovely to receive! For my bath tea, I calculated my costs -- about 25-26 cents per bath tea bag, including decorative envelope, for presentation. If I made a gift or stocking stuffer of 2 bath tea bags, my cost would be about 50 cents. I usually give my cost breakdown at the bottom of a post. But as this gift idea is billed as a low-cost one, I wanted to give cost breakdown, upfront. or, rose and peach soap-making fragrance oils, purchased w/ coupons (50 and 40% off coupons, respectively, for Michael's and Hobby Lobby), $2.50 for .5 oz of rose fragrance, and $2.40 for 1 oz. peach fragrance, using a combined amount of 40-50 drops, or .067 ounces, for a cost of about 25 cents of soap fragrance oil, if mixed 50/50 peach and rose. Bath tea is a blend of aromatics and skin soothers, neatly packaged in a little bag, to infuse your bath water for a heavenly soak. You drop the entire bag into the water as the tub fills up, and allow to steep throughout your soaking. The bag itself keeps the contents from making a huge mess in your tub. Gather your ingredients, make or obtain your tea bags. You can purchase large tea bag empties, from a tea shop or a retailer like Amazon, such as Finum 100-ct large tea bags, for about $6 (6 cents each bag, a decent price if you want to make large quantities of bath tea as wedding shower favors). Or, you can make your own tea bags out of paper, basket-style coffee filters. I use filters from Dollar Tree (150 filters for $1). Each filter makes one bag. Flatten out the filter, and press with an iron on the lowest setting. It won't iron completely flat, but will flatten enough to make cutting and sewing easier, as well as give a better presentation. 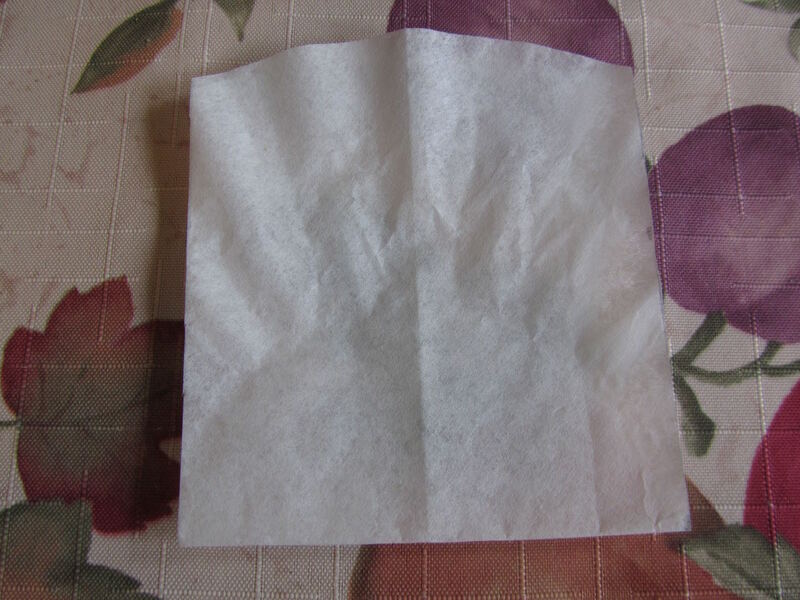 Fold the filter in half. 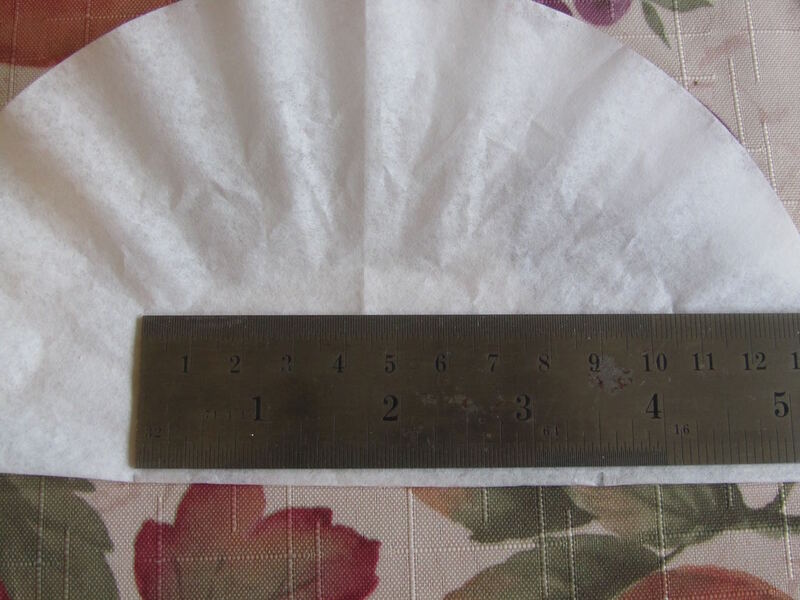 Use a ruler to mark a 3 1/2 inch wide section of the folded filter. 3 inches for the pocket of the filter, with 1/4-inch seams down each side. Cut out the 3 1/2-inch wide section of the filter. 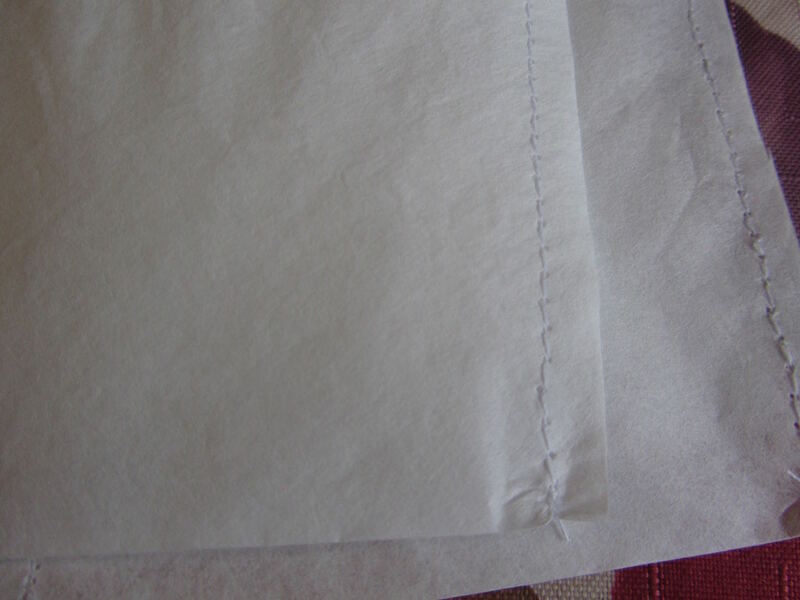 Sew up the sides, using 1/4-inch seam allowances, but leave the slightly curved opening un-sewn. Clip the threads. You now have a bag to fill with your bath tea! 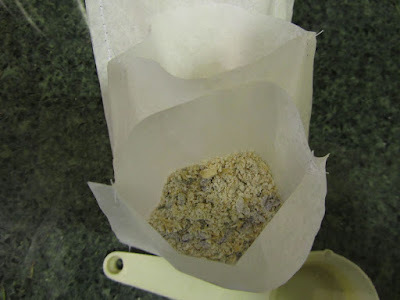 put 1/4 cup of regular oats into a coffee grinder or blender. Process until you have a coarse meal. Pour into a glass bowl. add about 40-48 drops of lavender essential oil to the oats/lavender buds, and stir together. 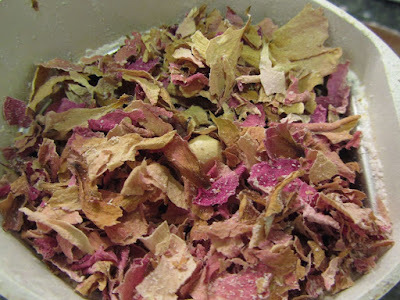 in the coffee grinder, process dried rose petals, in 1/2 cup increments, until you have about 1/2 cup of packed, chopped rose petals. store the bath tea in an airtight container or ziploc bags until use. To use, place one bath tea bag into the bathtub, as it fills with hot water. Allow to steep for the duration of your bath. It's a good idea to try one of sachets, before filling all of them. You can keep your bath tea mixture in an airtight container, loose, until you are certain of the strength of fragrance you want. An easy "tea bag" for testing the mixture is simply one coffee filter, with mixture in center of flat filter, then sides pulled up together, and held closed with a rubber band. Decorative packaging, the paper envelopes, next week. . .
Wow! All the goodies you are making are giving me panic attacks! I don't have a creative bone in my body and just reading all these things you do...wow! My son came home with a tear in his pants and asked me to mend it. I panicked the whole way trying to patch it up because the pants are so worn out that the patch was very large. He just can't take the time to get a new pair until Christmas so my creative energy flowed to get a good patch sewed in the crotch area. That is really hard to position in that strange place. But I DID IT! We haven't done gift giving for several years now and this year will no exception. I just don't have any money so the kids all understand. Our family's don't do gift giving either and we don't really even get together a lot on my side. My husband's side will maybe do something though MIL doesn't like the fuss. Someone will suggest we get together and then there will be a last minute thing put together. Then we all buy $5 gifts to play the pass-around game. Awesome job on the patch, Alice! I agree patching the crotch of pants is very tricky. You've bought your son a month with this pair of pants. That's well-worth doing, I think. I hadn't heard of bath tea before. It sounds like a lovely addition to a good soak in a hot bath! Thanks for sharing the instructions. I have so many new gift ideas now. You're welcome. Sometimes, it's called tub tea, or bath soak, if that rings any bells. I used a peach-rose one the other day, and the fragrance was so soothing. I still have roses blooming in my yard, so I may go out today and gather more to dry, just for myself. Another lovely gift idea, Lili. Thank you for your very clear instructions! You're welcome, Mary. These are really easy to make, too, and don't require a lot of fussing around. Very nice! 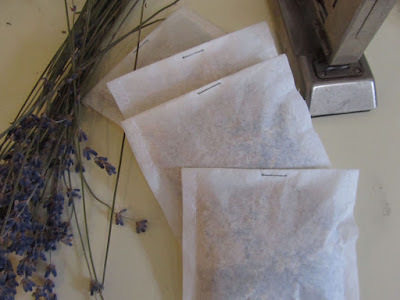 I tried finding lavender buds locally last winter--my daughter was hand-sewing sachets and was interested in using them. The only place I could find them was online, so I bought lavender essential oil and we dabbed it on cotton balls instead. Not as nice as the lavender buds, but it worked in a pinch. My husband and daughter tried to grow lavender last summer but it didn't go well. I don't know if you have a Cost Plus/World Market anywhere near, but in the cooking section with bags of spices, they sell lavender buds, for future reference. But online might be just as good a place. 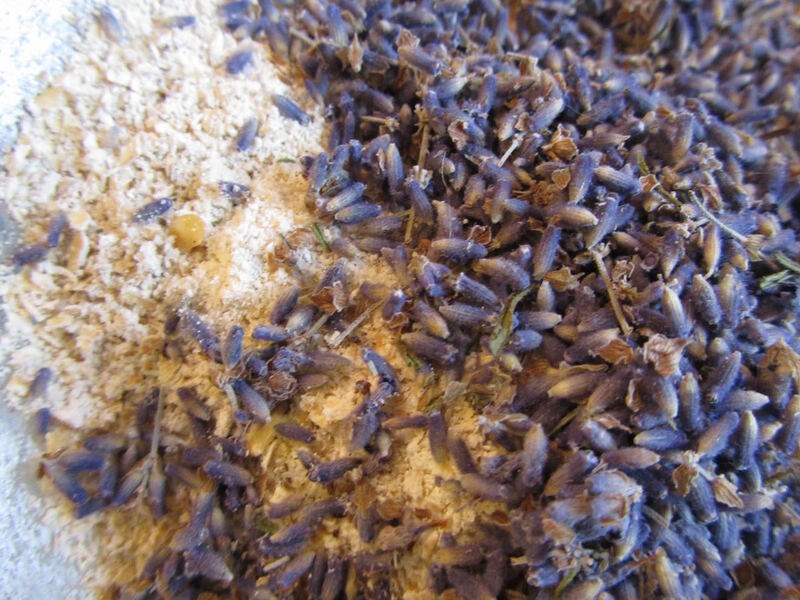 Did your daughter and husband plant lavender from seeds, or plants? From seeds takes time. I started a bunch of lavender from seeds a few years ago, and remember starting them indoors, in late winter, to plant out in early summer. And then, they were very small plants for the first couple of years. I don't think lavender would survive your winters. That sheet repair is fabulous, and nothing to be sneezed at! Sheets are expensive. You just saved yourself a bunch of cash over replacing that sheet right now. A lot of my sewing these days, is simply straight seams, making repairs. You did great! Have a fabulous day, Kris! Cost Plus is about a 45 minute drive from me, and I rarely make it there--that was the only "local" source I found. Interesting about growing it from seed--I think they started them during the summer from seed, so that was probably the problem. Kris, I've also seen lavender at Marshall's, in the gourmet food dept., with gourmet seasonings. I don't know if you have Marshall's in your area. Anyways, the cotton with essential oil sounds like it was successful. the stained paper did you just sew the paper in the machine? We have like 9 jillion dollars scrapbooking things. Yes, I sewed the paper on the machine. Take a scrap of your paper and just try different tension settings and stitch lengths and widths. With zig zag, I had best success with a medium width and length. Too long of a stitch and my needle skipped in many places. I'm making some seed packets later today, for home-collected garden seeds to give away. I'll show pics of those on Monday. Have a great weekend, Patti! that's a very good question. I have a few particular people on my list who either do prefer baths over showers, or really savor the occasional bath. So, the thoughts behind all of these items was more towards them than the friends/family who simply prefer showers. I'm making/buying other gifts for friends and family who I don't think would care much for the spa items. The one consideration I do have for almost all of my hand-crafted gifts is I prefer to give some sort of consumable, so that "stuff" doesn't just sit in a closet. Have a great day, KCMama, and thanks for asking a great question.